Victor Alexander John Hope, 2nd Marquess of Linlithgow (24 September 1887 - 5 January 1952) was a British statesman who served as Viceroy of India from 1936 to 1943. Succeeding his father in 1908, Linlithgow served on the Western Front in World War I, and then served in various minor roles in the Conservative governments of the 1920s and 30s, including that of Chairman of the Royal Commission on Agriculture in India and of the select committee on Indian constitutional reform. 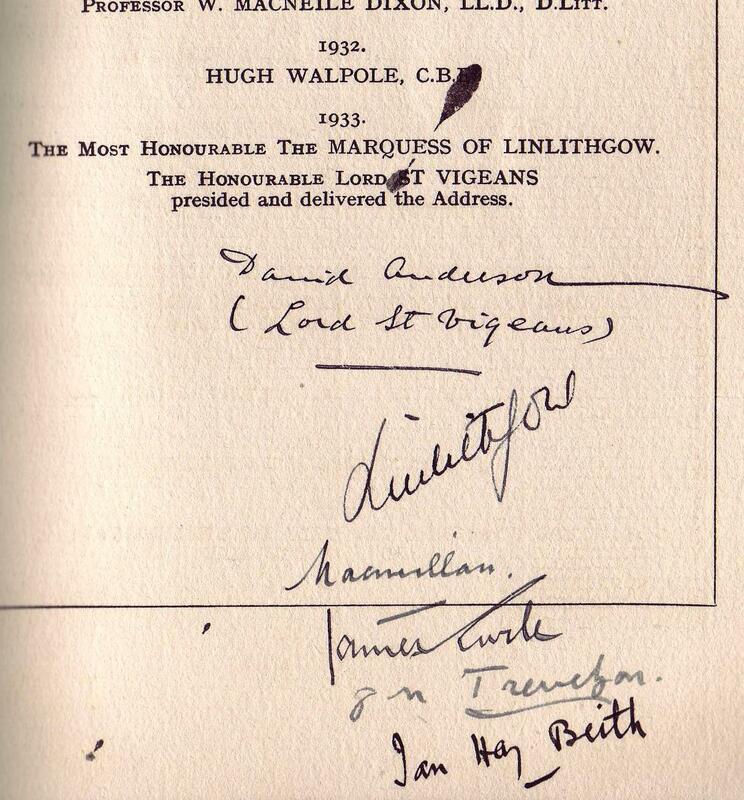 David Anderson (Lord St. Vigeans) gave the address in 1933, & became president in 1934, when the Marquess of Linlithgow made the address. Macmillan is the Right Hon. Lord Macmillan who became president in 1935, James Curle became president in 1936, Professor George Trevelyan in 1937 & Major General John Hay Beith (the popular writer who used the pseudo. Ian Hay) became president in 1938.